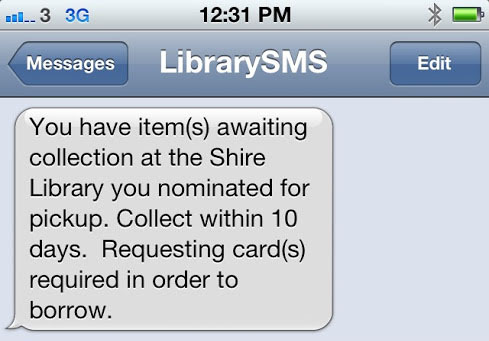 This morning many Sutherland Shire Libraries members will have received a number of SMS messages from us relating to items on reserve waiting to be collected. If you did receive messages from the library you can disregard them. They will relate to material or items you have reserved in the past weeks or months. You can check whether you do have items waiting to be collected currently by logging in to your account online. You will also have received an email or letter regarding the items for current reserves. If you have not received an email or letter you can assume the SMS messages relate to old reserves. We apologise for this mix up. With the introduction of the new system for the library in June this year the way that notifications are handled has changed. Whereas our previous system allowed members to receive notifications via postal mail or SMS, our new system allows a primary communication method of email or postal mail. SMS is an option, but it is only considered a supplementary notice and is sent in addition to an email or letter. Until now the SMS notices have not been sent. We have been working our vendor partners to introduce the option to receive the SMS messages but have been having difficulty getting our systems to work together to reliably, particularly with Telstra's mobile network. However, the ability to opt in to SMS notifications has been available on patron accounts for some time. Many members have logged in to their patron account and opted in to receive the SMS notifications when they become available. Even though the notices were not being sent, anyone who has opted in would have been generating SMS messages for holds that were filled from the date they opted in, possibly weeks or months ago. It appears these messages have been queued up and this morning the sending part was switched on, at which time all those messages were sent. I'm not sure whether this is a good thing or not, but those members who are customers of Telstra did not get bombarded with SMS messages this morning. It appears the SMS notifications still aren't working with Telstra's network. If the SMS messages don't bother you, don't do anything. Just rely on email or letters to check on your reserves for now. You can safely ignore the SMS messages in the knowledge that you will also get an email or letter about current items being held for you. If you don't want to receive the messages you can login to your account and opt out of the SMS notices. We'll announce when we have the SMS functionality up and running reliably on this blog, Facebook and Twitter. 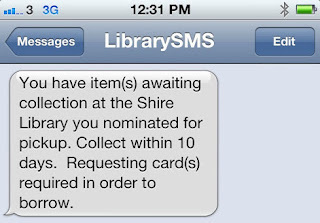 You can also check with staff whenever you visit one of the Shire Libraries. Once SMS notices are good to go you can opt in again. Once again, we apologise for the confusion caused and hope that you will stick with us while we work on introducing the SMS functionality. We appreciate your patience and wish to thank all our valued members for their ongoing support.